Your browser does not support the audio element please use an HTML5 compatible browser. On Friday, September 28, the Norris Group proudly presents its 11th annual award-winning black-tie event, I Survived Real Estate. An incredible lineup of industry experts will join Bruce Norris to discuss perplexing industry trends, head-scratching legislation, tech disruption, and opportunities emerging for real estate professionals. All proceeds from the event benefit Make A Wish and St. Jude Children’s Research Hospital. This event is not possible without the generous help of the following platinum partners: the San Diego Creative Real Estate Investors Association, InvestClub, Inland Empire Real Estate Investment Club, ThinkRealty, Wilson Investment Properties, Coach Fullerton, First Lending Solutions, PropertyRadar, the Apartment Owners Association, MVT Productions, and Realty411. Visit www.isurvivedrealestate.com for event information, and see Amazon Prime or YouTube for past events. Bruce Norris is joined this week by Dr. Christopher Thornberg. Dr. Thornberg founded Beacon Economics, LLC in 2006. Under his leadership, the firm has become one of the most respected research organizations in California, serving public and private sector clients across the United States. In 2015, Dr. Thornberg also became director of the UC Riverside School of Business Center for Economic Forecasting and Development. He is also an adjunct professor at the school. He is an expert in economic and revenue forecasting, regional economics, economic policy, and labor and real estate markets. He also consults for private industries, cities, counties, and public agencies. 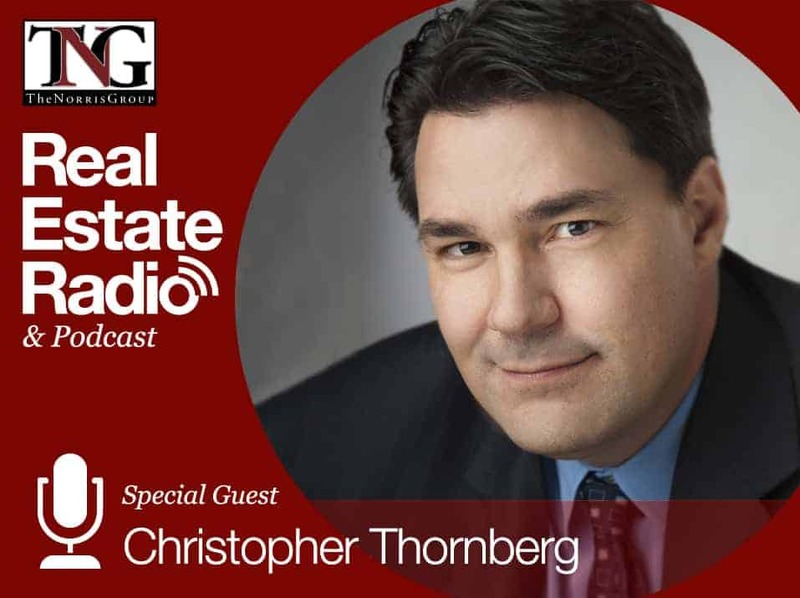 Dr. Thornberg became nationally known for forecasting the subprime mortgage market crash that began in 2007; and he was one of the few economists on record to predict the global economic recession that followed. How do Quantitative easing and the Fed reduced balance sheet affect the economy? Is the 4.1 quarterly GDP growth giving the Fed more permission to raise rates? Where is GDP growth headed in 2019? Could interest rates go negative? What could cause the next recession? Are the current U.S. demographics in a negative or positive position for GDP growth? What short and long-term impacts could robotics, AI, and 3D printing have on the economy? Bruce and Christopher began by discussing the end of quantitative easing and the Fed reducing its balance sheet. Bruce wondered how this impacts the economy. Christopher said one of the largest impacts is how it is reducing inflation. This is odd considering every time you pick up the newspaper or go online, almost assuredly you see another commentator talking about how inflation is a hugely negative impact in our economy today. In reality, when you look at the Fed reversing its actions and getting rid of that balance sheet, you have watched money supply growth shrink to the lowest it has been since the middle of the Great Recession. This is broadly deflationary, especially when combined with relatively low bank-lending. It flies in the face of Fed policy, which is responding as if inflation is a given. It has been hiking its rates along with shrinking its balance sheet. This is an interesting place we are in right now. Bruce next went on to say this is a place we have never been in prior. However, Christopher said not in recent history, although certainly we have never had such pervasive lack of inflationary pressures in the U.S. economy. Although not completely deflationary, we are in a low inflation rate regime and it is absolutely an issue for Fed policy. However, the Fed does not seem to care. When we think about what they are doing in hiking short-term rates, pushing that Federal fund rate up, and flattening the yield curve, you could argue it is a reflection of the peculiarity of our economy today. Policy-makers are running around solving problems that don’t actually exist and potentially doing more harm to the economy than good. The Fed is one of many examples of that. Bruce asked Christopher if he sees the 4.1 quarterly GDP growth giving them more permission to raise rates. He said no because the 4.1% increase was largely driven by the Fiscal stimulus plan put in place at the end of last year. Personal and corporate taxes were being cut pretty sharply along with an increase in government spending. The strong growth in business investment and consumer and government spending were all results of that fiscal stimulus. If you are going to tax less and spend more, that money has to come from borrowing. This is exactly what they have seen the Federal Government do. They have been sharply increasing their borrowing. It goes back to the shear hypocrisy of politics today. When Obama was running deficits, the Republicans were screaming bloody murder about it. They thought they would be like Europe, mired in a massive debt failure. Now, the Republicans are doing it even worse. Whereas Obama was borrowing all this money in the context of trying to help a healing economy, the Republicans are doing it in the context of a full employment economy where there is no reason to be using fiscal stimulus. Ultimately, fiscal stimulus may feel good today, but all that money has to get paid back. This means less spending and higher taxes tomorrow. We are simply mortgaging our future for this 4.1% growth rate today, which he does not think is good fiscal policy. Bruce asked Christopher where he sees GDP growth for 2019. He thinks it will still be solid and in the 2 ½-3% range. Fiscal stimulus gives you a short-term boost, then it fades off. However, the underlying sentimentals are still there. People keep asking when the next recession will be, and we are now in the midst of the second longest expansion in U.S. economic history. That, by itself, does not tell you much. The idea that counting months is a good way to predict the next recession is a little bit off-putting and not how it works. Every recession has to be caused by some shock to the system. To date, we have yet to see something that would rise to that level and push the economy off the growth path on which it is currently. They are trying, and if we continue to see expansion of the trade war and the Fed push rates up to the point they flip the yield curve, you could end up in a position where we can think about the end of this expansion. However, we are not there yet. Bruce next asked about the inverted yield curve. Bruce asked Christopher if he is a believer in that if it curves, the likelihood of a recession increases. However, he would not say this, largely because we do not really know the answer. There are two sides of it. The first side is every one of the last recessions was preceded by an inverted yield curve. It is probably one of the strongest indicators that we are about to go into a downturn. However, causation and correlation are different things, the latter of which he just mentioned. There are typically other issues at play. The Federal Reserve is typically responding to some growing imbalance inside the economy, and the result is rates being pushed up to try and cool things off to invert the yield curve. In a sense, it is a symptom of another underlying problem rather than a problem itself. It is not necessarily a certainty we will have a recession, but it not clear we would not have one. It is something else to keep our eyes on since it is not clear how it would permeate itself inside the economy. One of the problems with an inverted yield curve at these levels is that would be a first. Last time we inverted it, it was 6% and 8%. This time, it might invert below 3. Bruce said with the tools the Fed usually has, they reduce the short-term rate quite a bit, about 4-5 points. This time, they would not have this ammunition. Therefore, they would have to do what they did before and go back to quantitative easing. The point of Fed policy is to get money into the system. There are three ways to do this. The first way is to cut the Federal funds rate, which would make it cheaper for banks to borrow and them willing to expand their balance sheet. This only works in as much as banks are willing to lend more. This can be stymied by both banks’ natural inclination to be risk adverse and current policy regarding lending standards. If, as a result of the failure of the Federal fund rate, which cannot be pushed lower, then you may need to run around and start buying bonds. Usually you can buy them from banks or the open market and pay people cash for it. This injects cash into the system and is considered to be broadly stimulating in the short run. If that does not work, the last system that has not been used but could be is throwing $100 bills out the window of a helicopter. Ben Bernanke joked about this, but it gave him the nickname “Helicopter Ben.” Doing this would create utter chaos on the ground, but imagine if the Federal Reserve mailed everybody in the United States a $200 check. They have the wherewithal to do this since they control the money supply and can print up whatever they want. We do not have to reload the gun, so to speak. Bruce asked if he sees a chance of negative interest rates. He said not on the short end. This was something we saw happening in Germany on the long end. Long-run rates have been drifting up lately and running around 3%. This is a perfectly reasonable number because of how fast we are seeing the economy growing. Last time interest rates were running above 3% was back in 2014 when the U.S. economy was growing at a similar clip to what it is now and the global economy was too. He does not see rates going into that territory since we have a strong enough economy and there is enough demand for this money. Therefore, rates will likely stay in positive territory. We have a 3% ten-year and a 4% GDP growth. If we had 2 ½ and 3 annually and full employment. Bruce wondered if a ten-year has ever been at 3% with full employment. Christopher said this was the case back in the 50s and 60s, but this is very unusual. It has been a while since we had the high inflation back in the 70s and 80s. What we are really doing is returning to some levels of a historic norm. Bruce asked if he is concerned about deflation and what could cause it. Christopher said a collapse in money supply would be deflationary for the economy. Deflation is, at best, a short-term problem. The worst case scenario is they can start printing money and end deflation. Christopher said to him, deflation is not a critical issue for the U.S. economy. It is manageable, as the case may be. Bruce asked his opinion on what causes the next recession. He said not yet, although he is still watching to see what is happening. Real estate and debt markets seem okay, although he is a little worried about Federal Reserve policy and the potential for a massive trade shock because of ongoing trade concerns. However, now that they announced a negotiation with Europe, it looks like this may be fading away. A unilateral battle with China will not push us over the edge; it would have to be a global trade battle. The fact that they are basically backing off on Europe and talking to them about trade negotiation is a hysterical irony. We have to appreciate that during the election, Trump was incredibly negative on the Trans-Atlantic trade partnership that was going through. They demonized it, killed it, created trade shock, brought it back, and said it was wonderful. This is why Bruce and Christopher hate politics. It is so horrendous. Christopher assured everyone this session was not about being a Democrat or Republican, it was just amazing to him how politics in this day and age have devolved to this shear level of craziness. It is almost George Wellian. At every I Survived Real Estate event, Bruce always asks everyone on the panel their last thought. His is always that he wants every elected official to act like an American, not a Democrat or Republican. 30 years ago the Democrats and Republicans agreed on what the problems were, but they would disagree on the solutions. They had different priorities and philosophies when it came to policy, but they at least understood what the problems were. Today, they can’t even seem to agree on that. We have truly moved into this world of political double speak, and it’s very scary. From day one after the election, it seemed like the whole plot is how to win the next election. Forget about trying to accomplish anything, let’s just make the other side look ridiculous. By doing this, you create extremes. The other side is extremely one way, so we have to do the opposite, and it’s very hard to get something done when you start with this scenario. As an American, it is very frustrating to watch this since a lot of important decisions are not being made that will have a price tag later. They are getting bigger instead of smaller, and it is unfortunate. While they are running around looking for solutions to problems that do not exist, there are numerous real problems that do exist and are getting worse. You have very real problems with pensions and entitlements. The government borrowing situation will become critical in a decade, we are not investing in infrastructure, and our tax system is still a complete wreck. It is a scary time, and we do not seem to have the ability or wherewithal to fix it. Bruce next asked about the U.S. demographics and if it is negative or positive for GDP growth. Christopher said it is absolutely negative. The boomers were by far the biggest generation ever relative to their parents. Christopher’s running joke on this is all boomers are raised in a family of approximately 14 kids. They were so traumatized by the experience that they had 1 ½ kids. They excessively over-parented them, thus giving up the millennials. What has happened is our population pyramid has turned into a population column. Millennials are the biggest generation ever, but that is only because they are 2% larger than the boomers. If you look at growth in 25-54 year olds over the course of the last ten years, it has not grown and has been flat. We have a real problem on our hands. From a demographic standpoint, we are not adding enough people to continue to fill jobs. This is a problem from a financial perspective. Who is going to pay all those bills? It is also a problem from an employer’s perspective, hence some of the tightest labor markets ever. The solution is very simple: more immigrants. If you want to debate how immigrants got into this country and on what basis: family, skills, legal, illegal, we would just need to know what we are debating. Right now, this administration has an open antipathy towards immigrants. This is particularly true of immigrants of darker shades than the administration. The result of that is immigration has really been slowing down, taking a problem, and making it worse. For your individual worker in the United States, there is an upside to all this. Wages are growing very nicely right now. Consumer spending has been nice and strong, and businesses will be forced to invest more. That will be how companies prosper in this environment. You have to invest in capital in order to increase output and grow your profits. There are positive sides of it, but it will constrain growth except for these short-term bursts as created by unnecessary fiscal policy. With innovations like robotics, artificial intelligence, 3D printing, and self-driving cars, Bruce wondered what the short-term impact is on the economy and if it is different than the long-term impact. Christopher said no. Every time you turn around, somebody is always screaming the end of work because of robotics. You can go all the way back to the group in the 1600-1700s that went around smashing farm machinery because they were sure that these machines would take all the jobs away from people. The idea that technology causes massive dislocation of people is not true. If you look at where we are today with all the information technology running around and massive increases and productivity in manufacturing, the unemployment rate has still never been lower in the U.S. It’s evolution, not revolution. There is nothing particularly unusual about this next wave of innovation, it is just more labor-saving. Christopher remembered talking to his father once about this, and he was quite positive that all the jobs would be consumed by capital. Christopher pointed out to him that there was a point in time when 90% of all jobs in the United States were in agriculture. 90% of people were being used just to fee ourselves. Today it is about 1%, and it doesn’t matter. There are plenty of jobs out there and for people to do, and that will continue to be. Right now, given the labor shortages we are seeing as a country these should all be welcome relief. When the next downturn comes, one of the downsides of this is labor markets take longer to re-heal. It is less of a long-term impact and more of a short-term impact. When we do have recessions, the bounce-back in employment is slower than it would have been 30-40 years ago. This is an issue that should be handled by appropriate policy wrapped around avoiding the recession in the first place and tackling problems appropriately. In the context of the downturn itself, it is using appropriate fiscal monetary policy to limit the overall impacts. It can be handled on the other end if we have a responsible government, hence the problem. The Norris Group would like to thank its Gold Sponsors for supporting I Survived Real Estate: Guaranteed Rate and Nathan Chabolla, In A Day Development, Inland Valley Association of Realtors, Jason Thorman with Coldwell Banker, Jennifer Buys Houses, Keystone CPA, LA South REIA, Las Brisas Escrow, Lawyers Title, Michael Ryan & Associates, New Western, NorcalREIA, NSDREI, Orange County Real Estate Investors, the Outspoken Investor, Pacific Premier Bank, Pasadena FIBI, Pilot Limousine, SJREI, Spinnaker Loans, South OC REIA, Tri-Counties Association of Realtors, uDirect IRA Services, White House Catering. See www.isurvivedrealestate.com for event information.